Painting with good material is essential. When I just getting started with watercolor, I thought I use some cheap ones and upgrade them later on. That end up to be a mistake. Cheap, poor materials will make your job harder! If you use cheap materials, your paintings will look cheap. That doesn't mean you buy every expensive product out there. It means to find out what works for you and spend money on what's essential. I live in the Seattle area. Naturally my preferred brand for watercolor paint is Daniel Smith. 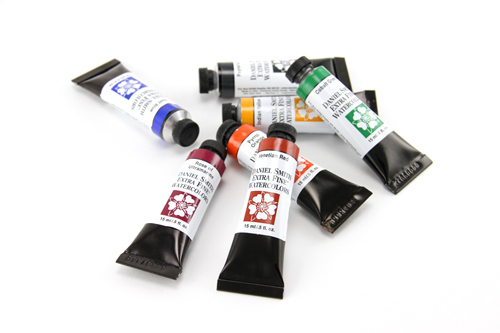 They are great watercolor paints with nice color intensity. Beware of false economy - Don't buy student grade paint just because it is cheaper. They are usually watered down, and you will end up using more paint. neutral tint, burnt umber, burnt sienna, yellow ochre, alizarin crimson, carmine, cadmium red, cadmium yellow medium and cadmium orange. For Brushes, I use Escoda Perla size 8, 12 and Escoda Aquario Mop size 14, 18. These are actually Joseph Zbukvic's signature brushes. You can find them here and here. They are a bit pricey, but to me it's well worth it! I prefer them not just because it's used by the artist I admire the most, but their ability to retain nice fine point is second to none. Granted, I haven't tried every single watercolor brush that's known. But I'd like to stick with what works. For larger washes, you want to use big mop like the Escoda Aquario. It holds a lot of water while still able to maintain a good shape so you can have control. For painting medium and smaller shapes, Escoda Perla gives me the flexibility and the control I need to paint any shape I want. I find myself needing to replace the Perla set a bit more often because I paint with their tip a lot, which makes the brush tip starting to bend. I am fine with it since it is the cheaper set of the two. Like canvas for oil paint, paper is very important for watercolor. Good paper can take a lot of water without damaging and it is able to absorb just the right amount of moisture. Currently, I prefer Saunders Waterford and Arches. I almost exclusively use watercolor block because it is very easy to use with little to no set up. They are glued on four sides so I have no need to stretch the paper or tape it on the board. After the painting is done and dry, I can easily detach it with a palette knife. I also only use rough surface, because it is important for the painting to have breathing room. While Arches and Saunders are both good paper. I find myself starting to like Saunders more lately. The paper is buttery-smoother while still having good texture. I find it easier to do a clean soft wash with Sanders than Arches. The only downside for Sanders is that the size of their watercolor block is really limited, and they are more expensive since it's harder to find in the US. Again, materials are really personal. I shared what works for me, but it might be different for you and your preferred painting style and subject. Don't be afraid to test out different things. Good materials should be able to help you to paint a good picture, no hinder you. I also suggest to invest into good materials. If you spent a decent amount of money on your materials, it might gives you that push to become a more serious painter who enjoys painting. Watercolor painting is hard enough, don't make it harder with cheap, low quality materials.